Sergio Coggiola (1928-1989) was an Italian designer known primarily for his automotive work at Carrozzeria Ghia in Turin for 15 years — serving as the head of Ghia’s prototype shop until 1952 — and later at his own company, Carrozziere Coggiola, which he founded in 1966 in Orbassano, Italy, a commune of Turin. In the 1980s, Coggiola freelanced for car manufacturers, sometimes executing third-party designs, such as Trevor Fiores design of the concept car Citroën Karin, the Lamborghini Portofino or prototypes of the Renault Megane. Coggiola also produced individual vehicles, special ordered by customers as one-off cars, including Bentley B2 and B3 coupes and convertibles, which Pininfarina had designed for the Sultan of Brunei — Coggiola making a total of 17 copies of this model from 1994 to 1996. Other original work included the asymmetrically designed Coggiola Janus (1978), the Fiat Punto Surf pick-up study and the 2000 Coggiola T-Rex, a SUV that used a Hummer chassis. 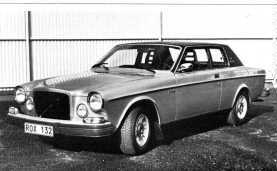 Other work included the Saab Sonett III, Volvo 262C, Lancia Thema Coupé,, Lancia Dunja (build only), Fiat Brava Sentiero, Pontiac CF 428 (with Paul Farago), the Copper Development Association (CDA) Exemplar I and the 1976 Honda Civic “Lady” prototype. Corrozzeria Coggiola declined quickly when founder and owner Sergio Coggiola died suddenly and the Turin design houses, including IDEA and Ital Design, declined offers to take over. ^ a b c Daniel Strohl (August 28, 2015). "Not seen in decades, copper-heavy Exemplar I concept car to emerge at auction". Hemmings.com. ^ Abbildung des umgebauten Volvo 164 auf der Internetseite www.volvobertone.com abgerufen am 1. Februar 2016. ^ Mark Arnold (April 24, 2008). "Humvee-Based Coggiola T-REX Makes Escalades Tremble". Jalopnik. ^ Beschreibung und Abbildung des Coggiola T-Rex auf der Internetseite www.caranddriver.com (abgerufen am 1. Februar 2016). ^ "Coggiola Prototype: 1976 Honda Civic Lady". Bringatrailer.com. ^ "Autocar & Motor, Volume 185". Haymarket, Pub., Limited, 1990. This page was last edited on 7 March 2019, at 19:30 (UTC).